Why settle for just a tub or a shower when you can have the magical luxury of both? Let us introduce you (in case you haven't encountered one of these in your lifetime) to the ingenious bathtub-shower combination. It offers the indulgence of a soak and the efficiency of a rinse all in one place. Talk about a space-saving solution! 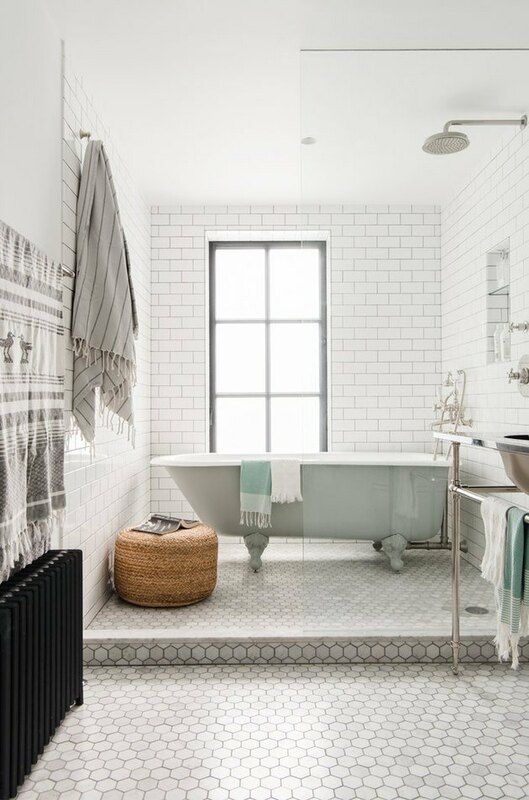 Scroll on for eight envy-inducing bathroom ideas that showcase our favorite hybrid. Your bathroom should be a respite from the annoyances of daily life. 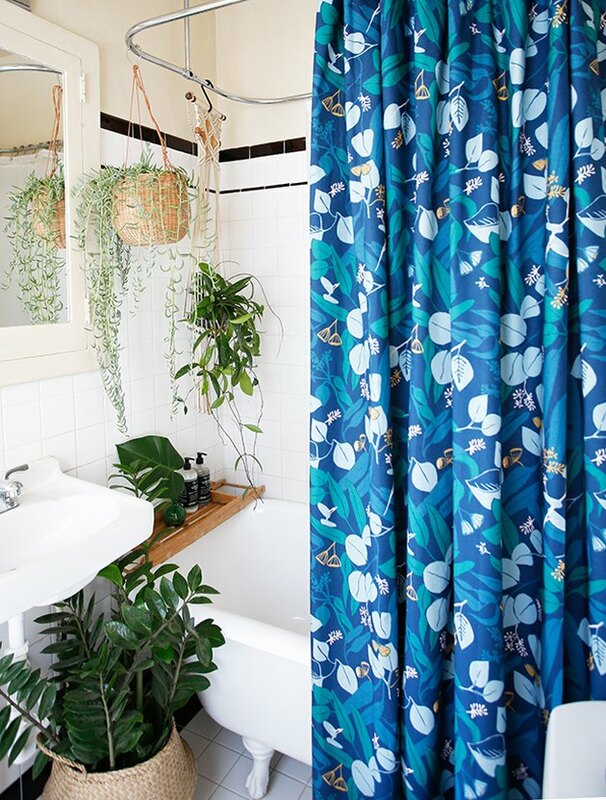 Jungalow's Justina Blakeney layers a vibrant blue shower curtain, woven baskets, and hanging planters to create a blissful bohemian oasis that's perfect for a stress-melting soak. 2. Encircle with a shower curtain. 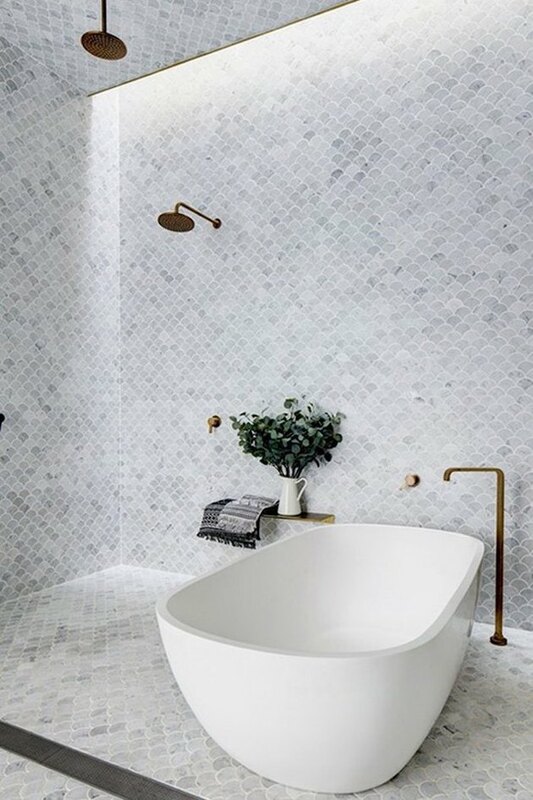 If you're lucky enough to have the space, encircle your bathtub-shower combination with a gauzy shower curtain like the team over at Bloom Interiors did in this dreamy bathroom. And bonus: Now there's no need for drapery. 3. Bring in industrial sophistication. 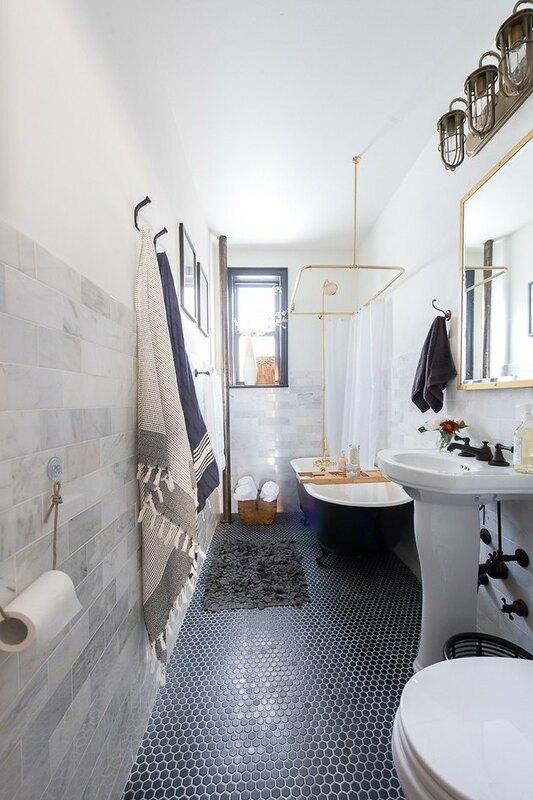 A black clawfoot tub, white pedestal sink, and black hexagonal floor tile put a modern spin on this industrial bathroom designed by Homepolish's Sandie Mazzi. But the introduction of exposed piping, cage lighting, and fixtures with mixed metal finishes feels refreshingly raw. Don't overthink it. When the bones are this good, all you need are a few cool accessories to tell a cohesive story. We're swooning over the Aztec runner and honeycomb shelves in this Culver City, California bungalow. 5. Consider a clawfoot tub. 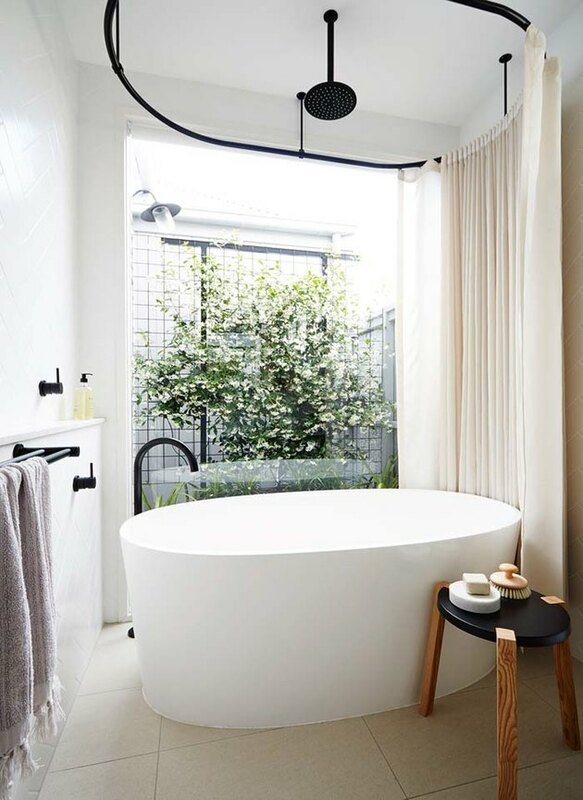 Love the look of a clawfoot tub, but don't think it's possible in your pad? 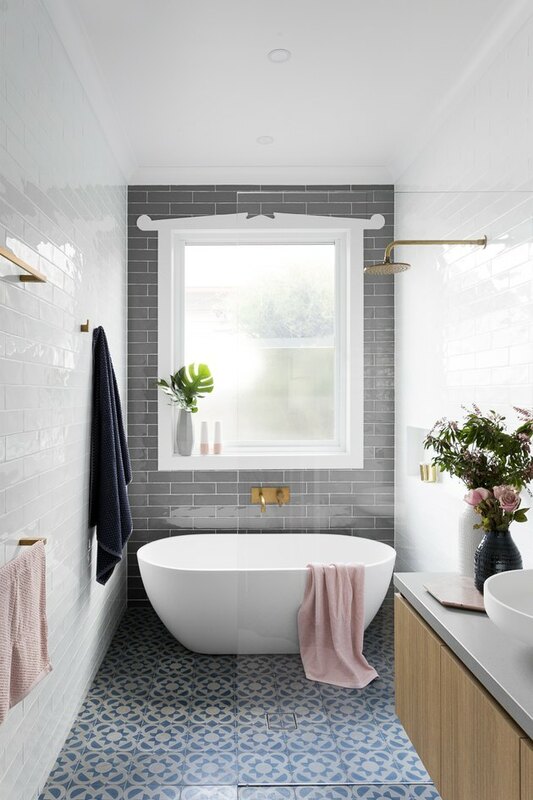 Check out this best-of-both-worlds setup by designer Elizabeth Roberts that combines a walk-in shower with a vintage-style bath. The glass enclosure keeps the space from appearing closed off. Cookie cutter is boring! 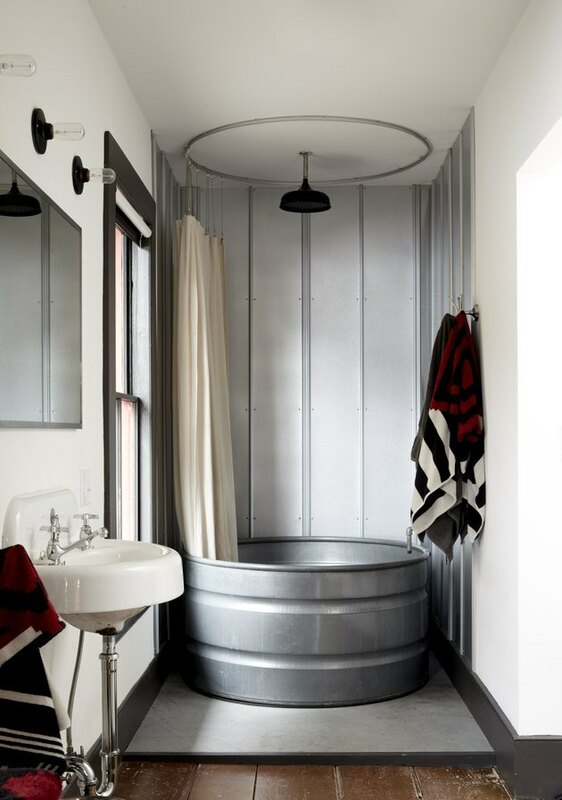 Think outside the proverbial box like the Stickett Inn did and go with a galvanized steel basin. Weathered wood floors and a ceramic wall-mounted sink round out the rustic effect. 7. Opt for an accent wall. Want to make your bathtub-shower combination come to life? An accent wall is the way to go. GIA Bathrooms and Kitchens designed this eye-catching refuge, complete with a gray backdrop and window to lend depth and visual interest. Plus, the patterned tile floor doesn't hurt either. 8. Or, make a statement with floor-to-ceiling tile. Floor-to-ceiling anything is a high-impact decision. That said, it doesn't have to be overpowering. 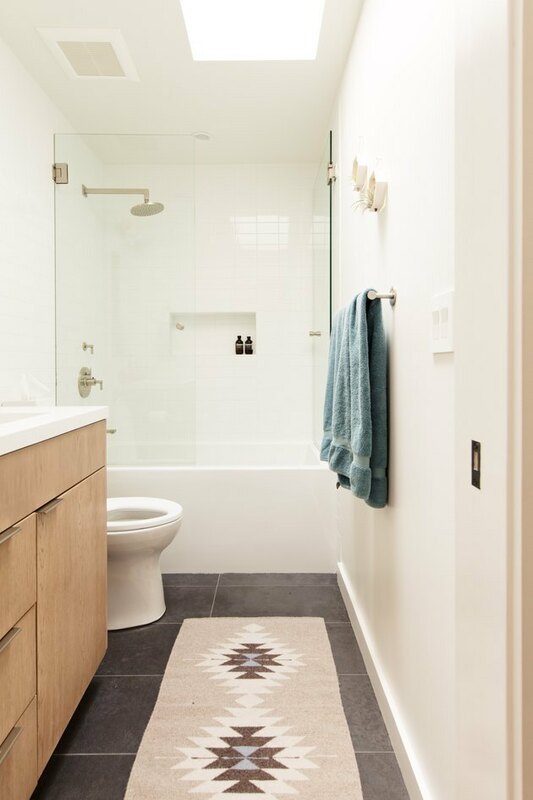 Case in point: This soothing gray sanctuary, designed by Carter Williamson, that's swathed in marble mosaic tile.